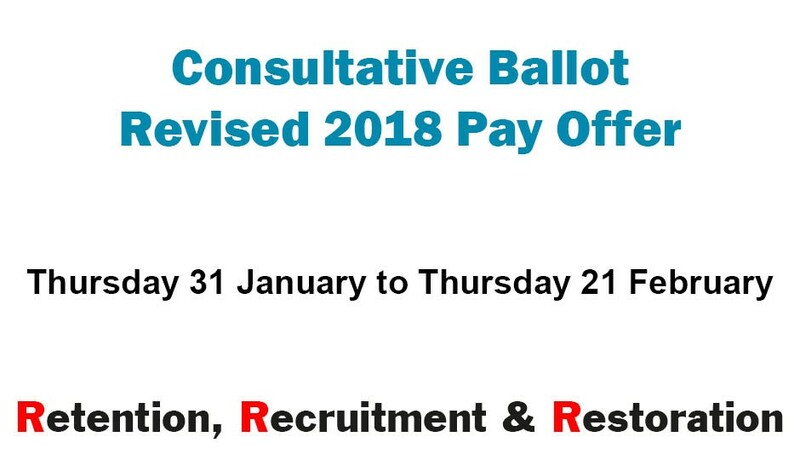 The Consultative Ballot on the Revised 2018 Pay Offer is now open. The Consultative Ballot is open until 12 noon on Thursday 21 February. Please note: only members employed by a local authority will be invited to participate in the consultative ballot. We strongly encourage all eligible members to cast their vote in the consultative ballot. Emails inviting members to take part in the consultative ballot were sent to members preferred email addresses at 8am this morning from the SurveyMonkey website. If you have not seen the email, please check the junk/spam folder in your email account. The subject line of the email is “Consultative Ballot on Revised 2018 Pay Offer”. Letters with instructions on how to take part in the consultative ballot are being sent to members we do not hold email addresses for. The SSTA Salaries and Conditions of Service Committee is conducting a Consultative Ballot of members on the revised pay offer. The Consultative Ballot will commence on Thursday 31 January and will close at noon on Thursday 21 February. Please note: only members employed by a local authority will be invited to participate in the consultative ballot. The detailed Revised 2018 Formal Pay Offer was issued to members by email on Tuesday 29 January. members will be asked whether they accept or reject the terms of the revised pay offer. an additional question only for those members who reject the offer whether they are prepared to take strike action to get an improved offer? In the event of a rejection of the pay offer in the consultative ballot the Salaries and Conditions of Service Committee will move to a formal Ballot for Strike Action should the thresholds of the UK Government’s Trade Union Act be met.